Interesting! But I always find data on income confusing at best — particularly when it is applied to questions of poverty. 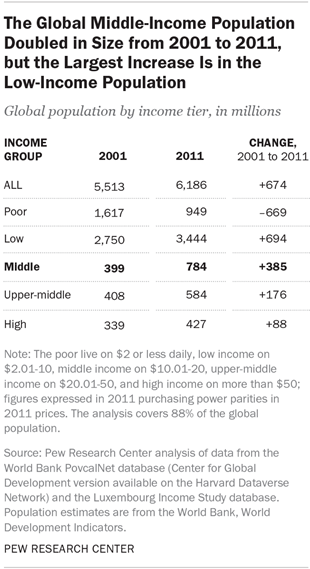 What is Pew measuring when it measures income in oral communities, where nearly a billion people live? Is it measuring increases in household wealth, or increases in the monetization of the local economy, or as mix of both? I was recently working in East Africa and in village after village finding that householders needed to spend money today to solve problems their parents could solve with no money at all. This was particularly true for ceremonies like funerals and weddings, where social expectations demand the use of cash today, but may not have until quite recently. But it is also true for some consumer items, from salt, oil or soap to airtime or basic schooling. In a pre-monetized economy, it was possible to live for long periods without necessarily having to ‘worry about the next meal’. After all, wealth was stored in cows or chickens (and in many places still is), and in emergencies these could always be sold or eaten. Are you sure, in the context of steadily expanding global monetization, that people are actually economically less vulnerable simply because they earn another $0.50 or $1 a day? I cannot rule out the possibility that you are right, but the case may be harder to make than you are suggesting here. I have never seen a quantitative analysis of the impact of expanding monetization on poverty or vulnerability. Are you aware of one? Brett, I hear what you are saying and have wandered around E/Africa having seen similar. In fact, its not just Africa, everywhere you go, there’s a pride in just how little ‘cash’ money you need for daily life (not the special events you mention or the ‘trade goods’ of oil, salt, tea etc) in the rural regions. I’m not talking about each and every one – there is undoubtedly going to be a band that’s still in the volatile “2 to 4” segment, the floating class per AfDB, regardless of rural or urban or India or ASEAN or Africa. On the other hand, there has definitely been an overall upward mobility and economic emergence, that’s visible in India, and in Kenya and Nigeria and Rwanda etc Not each and everyone of these never quite certain numbers, but enough for a critical mass of change. Enough to say that there shouldn’t be a Bottom of the Pyramid. I’ve sensed this and seen this for the past couple of years, now there’s “official” metrics to show it. I’m not talking about income vulnerability per se so much as a mindset shift – an ambition which I hear when I talk to people that wasn’t there before. And that mindset shift, that ambition, the aspirations, they’re the ones which are upwardly mobile and they’re viral. There’s a lot that can be done when you’re not stagnantly thinking you’ll be mired in the struggle of the next meal. There’s a lot you can do for yourself when you’re optimistic that the next day might be a better one. It has little to do with whether you got today’s 50 cents or not. PS. 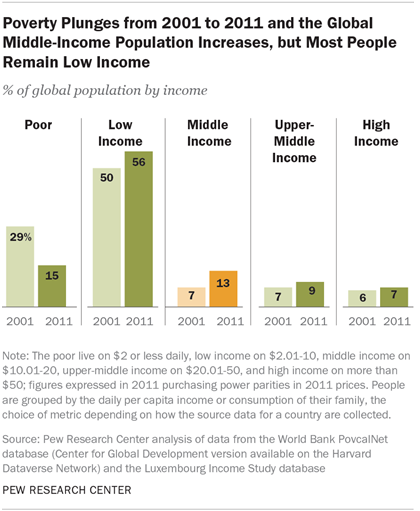 Pew’s data is from the World Bank’s MDG report, apparently.